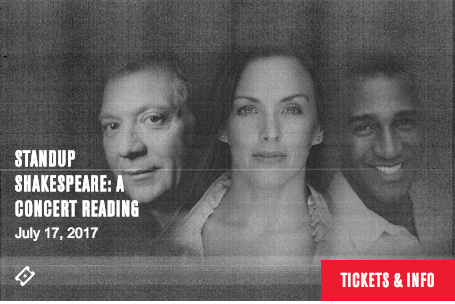 Steppenwolf’s LookOut Series is excited to announce a surprise summer performance of Standup Shakespeare: A Concert Reading with music by Ray Leslee, book by Kenneth Welsh and words by Shakespeare, of course. This event, which is a benefit concert reading for the theatre, showcases the extraordinary talent of Steppenwolf co-founder Jeff Perry alongside Broadway legends Norm Lewis and Alice Ripley. The show will be at 6:30pm in Steppenwolf’s Downstairs Theatre, 1650 N. Halsted St. Tickets ($79-99) now on sale through Audience Services at 312-335-1650 or steppenwolf.org. Standup Shakespeare sets the timeless language of the Bard to the exciting rhythms of jazz, baroque, samba and gospel-rock original music. A fractured love story is performed by a modern-day Fool (Steppenwolf co-founder Jeff Perry) and Broadway legends Norm Lewis (The Phantom of the Opera, Les Misérables) and Alice Ripley (Next to Normal – Tony Award for Best Actress) in this concert reading. Accompanying the cast are Marshall Coid (Violin), Dave Dunaway (Bass), Ray Leslee (Piano) and Josh Plotner (Woodwinds). Jeff Perry is a co-founder of Steppenwolf Theatre Company. He served as Steppenwolf Artistic Director from 1982 to 1985 and 1986 to 1987 and was integral to the founding of The School at Steppenwolf, where he continues to teach and direct. Jeff's many acting credits at Steppenwolf include August: Osage County (also Broadway and London), Balm in Gilead (also Off-Broadway), The Time of Your Life (also Seattle, San Francisco), Picasso at the Lapin Agile (World Premiere), The Grapes of Wrath (also Broadway and London), The Caretaker (also Broadway) and Streamers (also Kennedy Center). Jeff currently portrays Cyrus Beene on ABC’s Scandal and has also appeared in Nash Bridges, Thirtysomething and My So-Called Life. Alice Ripley received the 2009 Best Actress in a Musical Tony and Helen Hayes Awards for her work in the Pulitzer Prize-winning Next to Normal. She made her Broadway debut in the original cast of The Who’s Tommy, and went on to star in the original Broadway casts of Sunset Boulevard, Side Show (Tony and Drama Desk noms), James Joyce’s The Dead, and The Rocky Horror Show. She most recently played three roles in the Broadway musical, American Psycho. Ms. Ripley is also a songwriter, and she has produced three albums with her band, RIPLEY. She has starred in the feature films Muckland, SUGAR!, Bear With Us, The Way I Remember It and Isn’t It Delicious, and appeared on the small screen in Girlboss, Blue Bloods, 30 Rock, and Royal Pains. Single tickets ($79-$99) go on sale Friday, June 23 at 11am at 312-335-1650 or steppenwolf.org. Student Rush Tickets: a limited number of $15 student tickets are available one hour before the show. Limit 2 tickets per student; must present a valid student ID for each ticket; steppenwolf.org/students. Flex Card Memberships: Anytime Black Card Members may purchase any ticket for one credit each, and Weekday Black Card Members may purchase balcony tickets only for one credit each. For more information about FlexCard Memberships, call Audience Services at 312-335-1650 or visit steppenwolf.org. Steppenwolf is located at 1650 N Halsted St near all forms of public transportation and is wheelchair accessible. The parking facility consists of both a covered garage ($11 cash or card) and an open-air lot, located just south of our theater at 1624 N Halsted. Valet parking service ($14 cash) is available directly in front of the main entrance at 1650 N Halsted St starting at 5pm on weeknights, 1pm on weekends and at 12 noon before Wednesday matinees. Street and lot parking are also available. For last minute questions and concerns, patrons can call the Steppenwolf Parking Hotline at (312) 335-1774. LookOut is Steppenwolf’s performance series that presents the work of artists and companies across genre and form, emerging artists and performance legends, quintessential Chicago companies and young aspiring ensembles, familiar Steppenwolf faces and new friends. Tickets to all LookOut programming are available through Steppenwolf Audience Services. Prices vary for each show. The LookOut Series is presented year-round and announced on an ongoing basis. John Zinn, Greta Honold and Patrick Zakem are the producers for LookOut. For more information, visit steppenwolf.org/lookout. Major support for Steppenwolf’s expanded 2016/17 programming is provided by the Lefkofsky Family Foundation, The Negaunee Foundation and the Zell Family Foundation. Major support for Steppenwolf’s New Play Development Initiative is provided by The Davee Foundation and the Zell Family Foundation. United Airlines is the Corporate Presenting Sponsor of Hir. Chicago Community Trust is Production Sponsor of Hir. Community partners include Lurie Children’s Hospital and Chicago Women’s Health Center.